Pia was the guardian for that evening. She sent me the following log, with her comments. The title is hers too. The first two photos are mine, the next five are by Pia, with the last photo taken by Solo. We were told by email that this session will be held at our new venue. 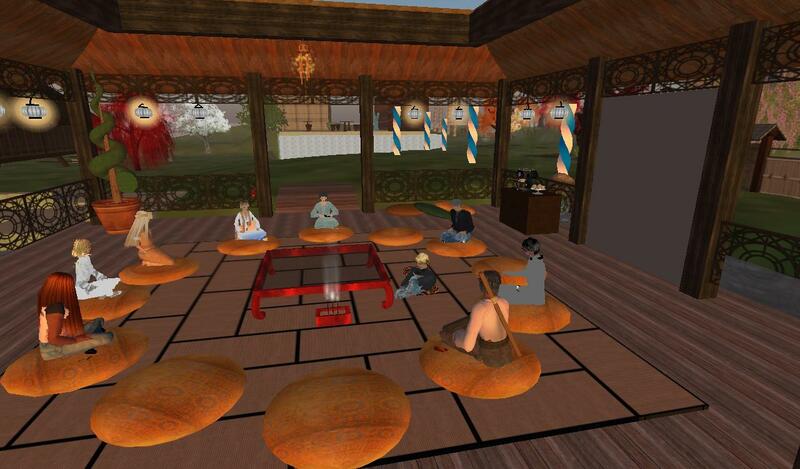 But I still rezzed at the teahouse, where I met Solo first. Then others. Afterwards, we teleported to the new place together and started to settle down at The Pavilion. Pia Iger: Hi, Solo, come for PaB? Pia Iger: you know the new place? Solobill Laville: Yep! Wanna go? Pia Iger: ok. let ’s meet those at teahouse. Pema Pera: Hi Steve, and Solo! Pema Pera: I hope everybody will get it! Solobill Laville: Or, prefer to walk? Pema Pera: it was a fun meeting! Pema Pera: And hi again, Solo! Pia Iger: cusion is really big. Pema Pera: Now let’s hope everyone will figure out how to make it over here . . . .
Steve was very nice to check if there were people left behind, while the rest of us were greeting each others. stevenaia Michinaga: shall I go back and herd the cats? Pema Pera: in so many ways! Pia Iger: I don’t think I met Solo before. Solobill Laville: Pleased to meet you Pia! Pia Iger: maybe he changed the outfit. Pia Iger: I am still checking out the new place. Pema Pera: how many in total? Pema Pera: first time, or have you done this before? Pema Pera: can you tell me your experiences, so far? Pia Iger: most time around this area? Pema Pera: yes, collective effort of many wonderful people! Pema Pera: there might be a way . . .
Pema Pera: it might not be easy . . . but within software basically anything is possible! Pema Pera: Hi Neela, good to see you again! Pema Pera: Bertrum, was it easy to find the new place? Pia Iger: Solo was talking about his mini-retreat here. Pema Pera: hi there Gar! Dakini Rhode: Pia, you look lovely! Pia Iger: Hi, Gar. And thanks, Dakini. Pia Iger: I thought you mean Me. Pema Pera: Oh, you’re always welcome Gar! Pema Pera: You’ve been here before, right? Our group is growing… we have mixed feeling of leaving behind the beloved tea house. Pia Iger: Is it just me, or really more people come here recently? Dakini Rhode: now you have more space for the crowds…. Pema Pera: yes, thanks a lot, Dakini! Steve sat on a tiny cushion and…started a typo talk. Pema Pera: yes, we can make up a word! Gar Hallard: stev? catching mis-spellings? Adams came, now we have 9 people. Pema told us the story of Moon making the TP sign. Dakini Rhode: no neon siren steams! Pema Pera: and he said: Dakini will kill me! Dakini Rhode: he was right! Pema Pera: slowly strangle then? Solobill Laville: You would drown him with compassion! Pia Iger: I feel we are already old freinds here. Neela Blaisdale: What a way to go! Dakini pointed out some features of the spacious pavilion. Pema Pera: beyond sirens and neon . . . .
Dakini Rhode: latte doesn’t do that? Neela Blaisdale: You have everything here! Name of a SL place came up. Pema Pera: Thanks, Adams, for the Assisi lm! Pema Pera: SL is such a big place . . . . .
Pema Pera: the church or also caves? 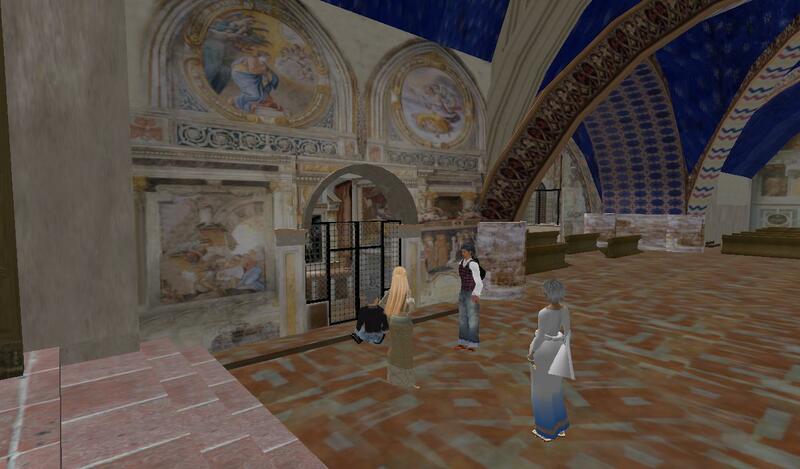 Pema Pera: Has anyone here visited Assisi in RL, by any chance? Solobill Laville: My favorite city in the world, Firenze! Pema Pera: hard to say in a few words, Pia . . . .
Pia Iger: thanks. will check it out. Pema Pera: with presence I meant: the landscape itself seems to convey something . . . .
Pema had to leave. Adams gave us Landmark of Assisi. 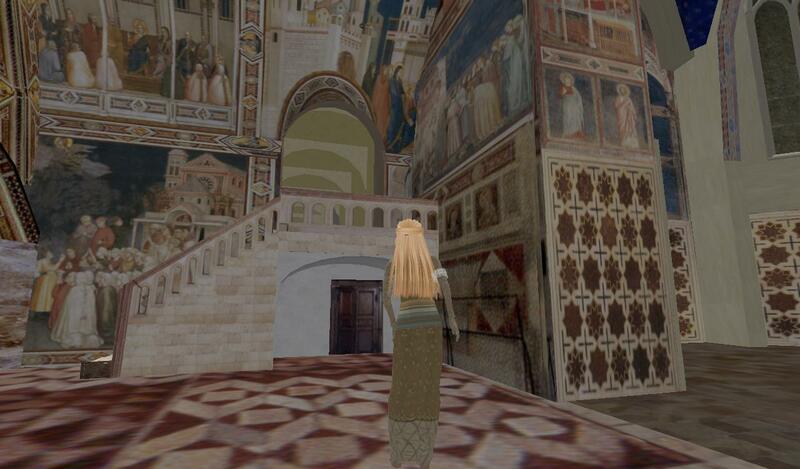 Neela Blaisdale: You mean a place in SL that’s like Assisi? Pema Pera: wonderful to be here at our first official PaB meeting in the new place! Pia Iger: np. will send you the log. Pia Iger: I am proud. Pia Iger: I have not been to many place in SL. Dakini Rhode: we need to do some field trips! Adams Rubble: did I miss anybody? Dakini Rhode: did you go to assisi. Bill? Solobill Laville: That was way too spontaneous! Solobill Laville: I thought you meant right now, Dakini! And we all agreed! Except that Gar and Adams had to go early and could not make the trip. Pia Iger: Adams can be tour guide. Solobill Laville: To Assisi! Andiamo! We arrived at Assisi. It took a while for everyone to rezz. Pia Iger: Hi, I am here. Pia Iger: all are here? Pia Iger: change to midday. 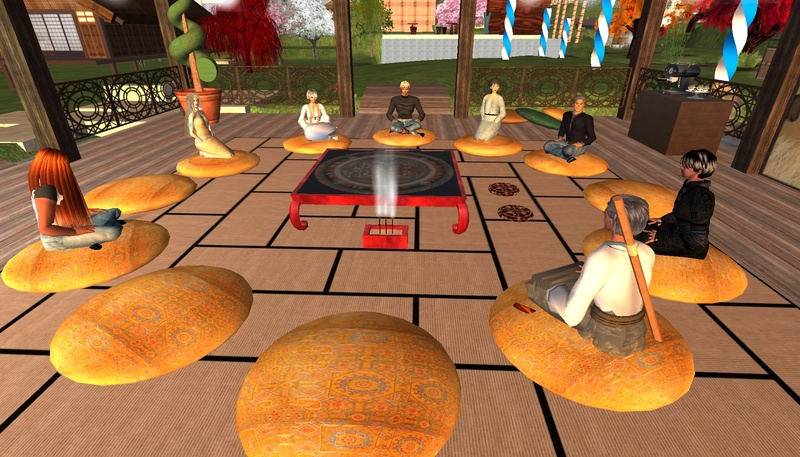 Dakini Rhode: some of us teleported while sitting? Neela Blaisdale: Does anyone speak Italian? Solo changed to a casual outfit, with a backpack! Now our group look 100% like tourists. Pia Iger: I like solo’s backpack. Solobill Laville: Thanks, it is my travel pack! And what Dakini and Solo were talking about?? I had no clue until later, cause on my screen, I walked 100% normal! Pia Iger: I want to take a group picture. Dakini Rhode: do you need to stop all animations? Neela Blaisdale: Do you see the frescoes here? I did not hear them, just marched on. Solobill Laville: Then, no more prostrating! Pia Iger: let me look around. everyone stay in this room. Don’t get lost. Pia Iger: Why do I need it, Solo? I look normal. Why they keep saying kneeling? See in the picture, I stand perfectly. Bert asked me for help. Bertrum Quan: pia, i’m having trouble walking here. is it the sim? or something else? Pia Iger: can anyone help Quan? Pia Iger: did you use what Solo gave to you? Pia Iger: stop all animation, wear it. Pia Iger: did you find it? Pia Iger: I just sent to you. Bertrum Quan: it’s attached to my arm now…. Pia Iger: At least you can walk now. Bertrum Quan: yes, true. that is funny! Pia Iger: oh. it is gone. I was happy that I helped out Bertrum. Then he convinced me that I did have the same problem! Bertrum Quan: why are you knelling when you stop? Pia Iger: great. Let’s do sightseeing. Pia Iger: I look normal to me. Pia Iger: really? I can’t see it. Pia Iger: let me wear that thing too. Pia Iger: To me it is same, Now I have the big ball on my hand. how did you take it off? Pia Iger: do I look normal now? Pia Iger: thx. Where are others? Pia Iger: My typist is tired now. Can we take a pic together, then I need to go? Solobill Laville: Shall we sit? Dakini Rhode: in front of the fresco? Solobill Laville: in a pew? Pia Iger: Ok. have fun, everyone. I already shot pics. Pia Iger: hard to control where to sit. Solobill Laville: THis looks like an album cover from the ’70s!! Neela Blaisdale: How are you sitting? Pia Iger: yah, no freedom here. This is the end of our first field trip! Pia Iger: anyway, good see you all. Solobill Laville: Our first filed trip! Pia Iger: You can send pic to Pema. Neela Blaisdale: Good night Bye all thanks it was fun!